The difference between our Ahmad Agha and Farhad was that Farhad had an ax in his hand, but Ahmad Agha had a pick on the neighbor’s wall. At the hospital, all efforts were made so Ahmad Agha does not get into depression as he might strike his head with the pick on his way to unifying people, probably under Farhad, friends, family members, and relatives’ persuasion who came to visit. They had brought him things to uplift his spirit and make him hopeful. They also talked about subjects that could boost his hopes. For instance, when they opened the compote can, they would say that there should be no distance between man and nature, and regarded the can a barrier to be taken away with the opener. This would allow Ahmad Agha to establish a direct connection with fruits. One person brought him flowers, another brought sweets, and candies, and a friend brought him the “Blind Owl” book. Ahmad Agha felt his bed had turned into a vehicle moving through the desert. A patient in hospital rope standing on the roadside was waving at him to stop. Ahmad Agha stopped his bed. The passenger got on the bed and sat on Ahmad Agha’s head. Ahmad Agha got a surrealistic vision. 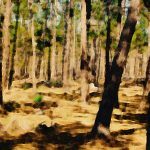 He felt all his veins had come out of his body and rolled around his neck like snakes and blood were running out of their mouths. He turned the page quickly just to relieve himself. His forehead was covered with cold drops of perspiration. Ahmad Agha rolled up the newspaper and tossed it out through the window. He would probably have rolled himself if there were no bars on the window. 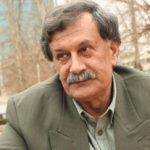 Emran Salahi (1946-2006) was a prominent Iranian satirist. 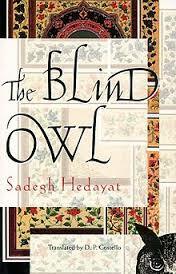 “The Blind Owl” by Sadegh Hedayat is a masterpiece of modern Persian literature. The novel first published in 1936 in Bombay. It is a dark novel. The narrator, a painter with mental problems and depression, is talking to a shadow on the wall of his room which resembles an owl. 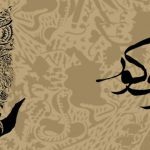 The book was originally banned in Iran on the pretexts of suicidal effects on its readers. The Blind Owl has been translated into different languages. 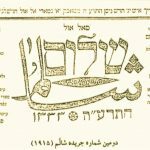 Emran Salahi titled this short story about the Hedayat’s novel.